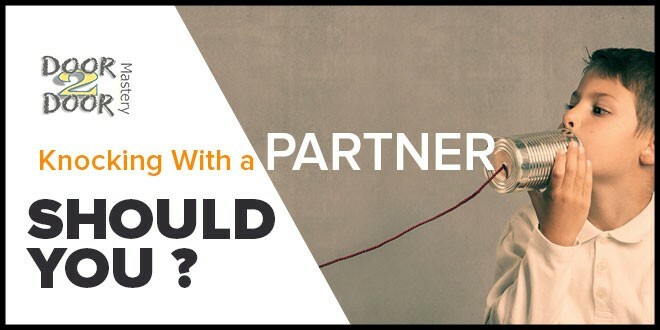 Home » Blog Posts » Knocking With A Partner, Should You ? Knocking With A Partner, Should You ? The extent to which people go when thinking about door to door sales blows my mind. 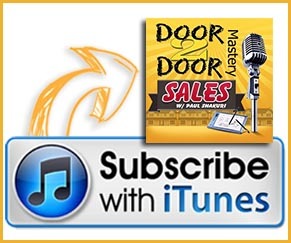 If you want to get better selling door to door, know that overcomplicating things really is hurting you. Stop thinking whether or not you should do this or that. A question i get asked often is whether or not you should knock with a partner. There are pros and cons to doing this. Lets dive in and talk about this. Knocking with a partner means simply having someone with you at the door prior to knocking on the door. If you are going to knock with someone my first rule of thumb that you must follow to avoid any complications is determining how you will split the commissions if you guys get a sale. The different way people split a commission are as follows. The person knocking on the door “Opening” the sale typically gets 100% of the sale, so long as he tells the other person who is with them that he/she does not need the other person to try to convince the customer to take what is being sold. The Person “Opening” the sale, also expects the person standing behind him to help contribute to influence the customer to purchase what they have to offer. If this happens and they get a sale, typically the sales reps will split the sale 50/50 ! Knocking with another person at the door can be beneficial for sales representatives that aren’t motivated to go out and sell on a daily basis. Many companies accept such behavior while others simply don’t. In my year round office i expect sales reps to keep there excitement long term. Im not to picky on whether or not they are knocking with another person so long as they understand that splitting the commissions means they have to do double the work in order to get the same result. 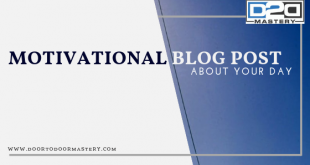 My advice is if you need that motivation and your just lacking it, listen to my Motivation Power Sessions and know how to prepare for your knocking day ! If you need that second person with you there because they are a power closer and you are a power opener, and you work hand in hand then by all means shoot for the sky, however focus on producing double the results and work as motivation for one another ! This can really be a powerful way to knock full time long term if you find the right knocking partner, your company allows and you two help pump one another up ! 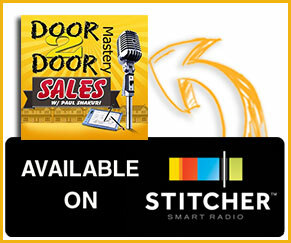 Next How Much Money Do Door To Door Sales People Make ?